@khussan has set 2.000 STEEM bounty on this post! Its nice to see you are happy with your pack. How cool! I have not had time to open some packs yet. I'm glad you did not get disappointed with what came in the package. 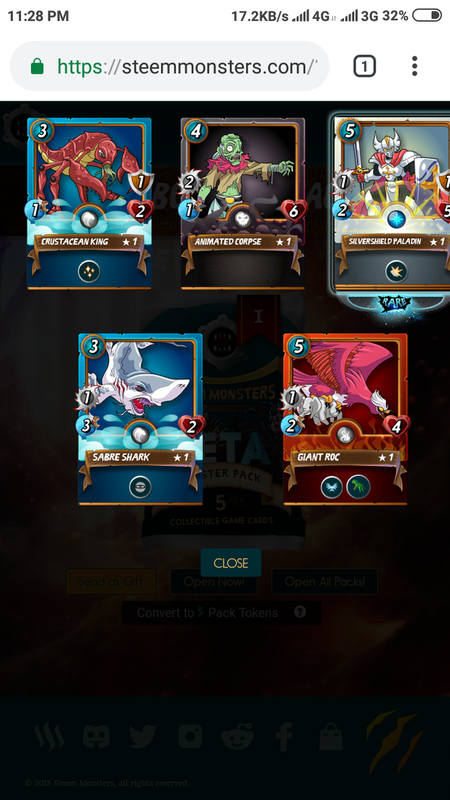 I wish you luck in your journey with steemmonsters! I will like to take part in giveaway. I see, I entered into that contest also. This giveaways card is preselect it is Giant roc to enter upvote+resteem and reply to post with "boost me up scotty"
If you would like you can try your forces now in tournanents. I think you can easy participate in novise league tournanents! Unfortunately mine expirience in tournanents was not very successfull, maybe in next time lucky will be at our side! Thank you so much for being an awesome Partiko user! You have received a 0.75% upvote from us for your 165 Partiko Points! Together, let's change the world!